We’re pleased to announce the donation to the Niki Charitable Art Foundation of arts advocate Lyn Kienholz’s personal archives related to Niki de Saint Phalle. These archives include correspondence, photos, proposals, construction and financial plans, event plans, notes and research, and original letters and drawings by Niki de Saint Phalle, as well as images of maquettes for unrealized projects and an array of other materials. Lyn Kienholz, a longtime advocate for the arts, is founder and president of the nonprofit California/International Arts Foundation, which partners with U.S. and international museums to organize and tour art exhibitions. She also serves on boards of directors for many national and international arts organizations and public galleries. We wish to express our deep appreciation for this generous donation. CHARLOTTE, NORTH CAROLINA, 22 MARCH 2011  The Bechtler Museum of Modern Art presents Niki de Saint Phalle: Creation of a New Mythology now through October 3, 2011. The exhibition celebrates the artist’s extraordinary appetite for myths and legends as interpreted through dynamic and often provocative sculpture, paintings and prints. The Bechtler offers 55 works inside the museum and five large-scale outdoor sculptures across the street in Wells Fargo’s public park, The Green, in addition to the Firebird sculpture that graces the museum’s plaza. The works in Niki de Saint Phalle: Creation of a New Mythology range from the whimsical and wondrous to dark and serious. The exhibition relies on a handful of interconnected ideas and opinions to reveal the intellectual depth and reach of Niki’s engagement with the worlds of myth, legend, religion and cultural archetypes. Many works by Niki are set in fantastic surroundings — dreamscapes populated by strange creatures, combinations of animals out of place with each other and their environment, sometimes threatening, other times benevolent and peaceful. Niki passed through various stages in her evolution as an intellectual, an artist and a woman and viewers will see several of these stages throughout the works in this exhibition. Niki de Saint Phalle: Creation of a New Mythology provides intellectual inquiry mixed with a sense of provocation, joy and delight. The exhibition marks the first time the Bechtler has displayed works from outside its collection. 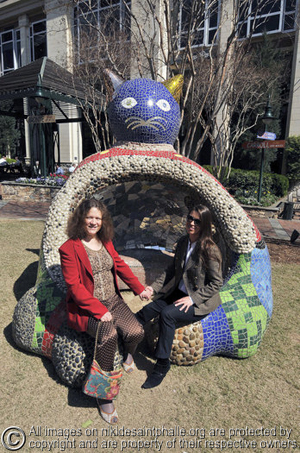 Fifty-nine of the 60 works are on loan from the Niki Charitable Arts Foundation. The whimsical and boldly colored sculptures, prints and tableaux éclatés (kinetic wall sculptures) represent five decades of the artist’s career. The Bechtler Museum of Modern Art in Charlotte, North Carolina, has announced the opening of its new exhibition Niki de Saint Phalle: Creation of a New Mythology, on exhibit now through 3 October 2011. The Bechtler, whose permanent collection includes works by both Niki de Saint Phalle and Jean Tinguely, is already home to Niki’s Firebird, a huge sculpture on permanent public display in front of the museum. To learn more about the exhibition and related events at the Bechtler, read the full announcement. The interview, nearly an hour long, includes a wide-ranging discussion of Niki’s life and work, her relationship with her lifelong partner Jean Tinguely, and the exhibition itself. Click and enjoy. “The Bechtler Museum of Modern Art unveiled a new exhibit Saturday in uptown Charlotte,” reports WBTV in Charlotte, North Carolina. “Five large-scale mixed-media sculptures by French-American artist Niki de Saint Phalle were placed in the Green, next to the museum.” The enormous sculptures, “large enough that kids can play in them,” include La Cabeza (2000), a six-ton skull in green, yellow, and red with room for a dozen people inside. Another, shown here, is Niki’s Grande Step Totem (2001). The Bechtler is home to Niki’s popular Firebird (a.k.a. Le grand oiseau de feu sur l’arche), now on permanent public display in front of the museum. For the indoor exhibition  entitled “Niki de Saint Phalle: Creation of a New Mythology” and running from 18 March through 30 September  the Bechtler will be showing about 60 additional works by Niki de Saint Phalle in its fourth-floor gallery, as reported in January by the Charlotte Observer. Watch this space for more news about this exhibition. 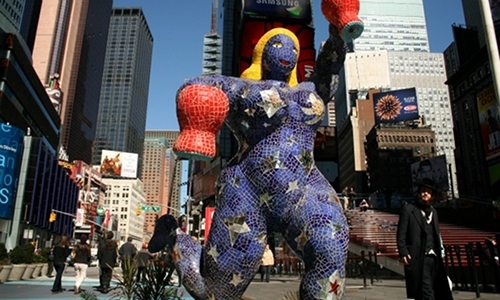 Niki de Saint Phalle’s colossal mosaic sculpture, The Star Fountain (Blue), will be on view free and open to the public at the 2011 Times Square Show, a large-scale outdoor group exhibition on Broadway and 42nd Street in New York City, from 17 March 2011. The sculpture depicts a flamboyant and playful ‘Nana’ juggling two large pitchers from which water constantly cascades. Standing nearly 10 feet tall, the voluptuous female figure is an archetype of feminine power and strength celebrating motherhood, sensuality, love, and life. Installed in the heart of New York’s theater district, its mirrored and stained glass tesserae, reflecting the city’s flickering lights and vibration, provide a rare opportunity to dive into Niki’s realm. This work is presented by the Nohra Haime Gallery, with the support of the Niki Charitable Art Foundation, in collaboration with the Armory Art Show and the Times Square Alliance. A reception will be held 1 March from 7-9pm at the Times Square Visitor Center. For more information, read the Nohra Haime Gallery press release. March 8 is the 100th anniversary of International Women’s Day. To celebrate, Kunsthalle Wien  which has extended the exhibition “POWER UP  Female Pop Art” through today  will feature a special midday program: POWER LUNCH, a guided tour of the show by curator Angela Stief. Later in the day, Ursula Leitgeb and Hafize Gültekin will offer another guided tour of the exhibition (in German, with translation into Turkish) with the title “Vorsicht, Emanzipation kann Ihre Befindlichkeit nachhaltig verbessern!” (“Warning: Emancipation can produce a lasting improvement in your mood!”). If you’re in Vienna and would like to register for the POWER LUNCH tour, contact Isabella Drozda at +43-1-521 89-1255 or kunstvermittlung@kunsthallewien.at. (Admission is € 5, which includes snacks following the tour.) For more information (also in German) about either event, visit the Kunsthalle Wien web site. Finally, if you aren’t in Vienna or just can’t make it to the show today, don’t panic. 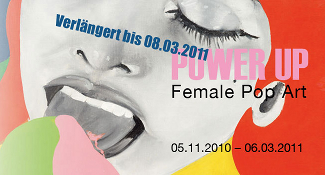 “POWER UP  Female Pop Art” will also be appearing at Phoenix Art/Stiftung Falckenberg (in cooperation with Deichtorhallen Hamburg) from 19 April – 10 July, and at the Städtische Galerie Bietigheim-Bissingen from 23 July – 9 October. Learn more about the exhibition. All five works will be on display until next Tuesday, 8 March. Learn more. NEW YORK, NEW YORK, 1 MARCH 2011  Niki de Saint Phalle’s colossal mosaic sculpture, The Star Fountain (Blue) (1999), will be on view free and open to the public at the 2011 Times Square Show, a major large-scale outdoor group exhibition on Broadway and 42nd Street, from March 1 through 7, 2011. Wittily executed in the artist’s signature sparkling colors, The Star Fountain (Blue) depicts a flamboyant and playful ‘Nana’ that juggles two large pitchers from which water constantly cascades. 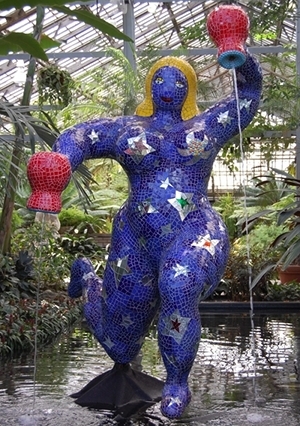 Standing nearly 10 feet tall, and made of polyurethane foam, resin, steel armature, glass pebbles, ceramic tiles, mirror and stained glass, the voluptuous female figure is an archetype of feminine power and strength. Decorated with cosmic symbols and stars in shades of white, red, yellow and blue, the majestic Nana celebrates motherhood, sensuality, love and life  themes recurrently explored by Saint Phalle. The sculpture’s illusory effects of light and color and the use of water create a magnetic attraction and meditative sensory experience. Installed in the heart of New York’s theater district, its mirrored and stained glass tesserae, reflecting the city’s flickering lights and vibration, provide a rare opportunity to dive into Saint Phalle’s realm  one of whimsy and fantasy. Internationally acclaimed for her oversized, voluptuous female figures, Niki de Saint Phalle (1930-2002) was a French-American, self-taught sculptor, painter and film maker of international prominence. She is best known for her public sculptures, such as the Stravinsky Fountain next to the Centre Pompidou in Paris (1983), the Tarot Garden at Garavicchio in southern Tuscany (1998), the Grotto in Hannover’s Royal Herrenhausen Garden (2003), and Queen Califia’s Magical Circle in California (2003). Saint Phalle, who began her career as an artist in the 1950s, was awarded the 12th Praemium Imperial Prize, considered to be the equivalent to the Nobel Prize in the art world, in Japan in 2000. Born in 1930, in Neuilly sur Seine, Saint Phalle died in 2002 at the age of 71 in La Jolla, California. This work is presented by the Nohra Haime Gallery, with the support of the Niki Charitable Art Foundation, in collaboration with the Armory Art Show and the Times Square Alliance. The Nohra Haime Gallery represents the Niki Charitable Art Foundation. 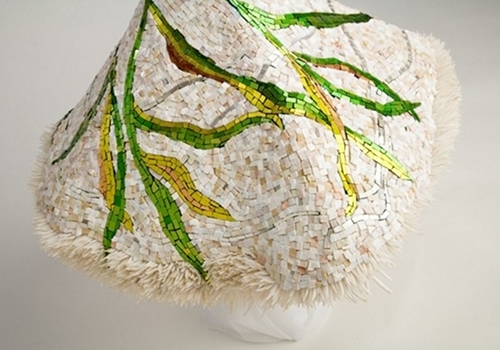 Texas artist Julie Richey has received Best 3-D Mosaic honors from the 2011 Mosaic Arts International, an annual international juried exhibition of contemporary mosaic art. 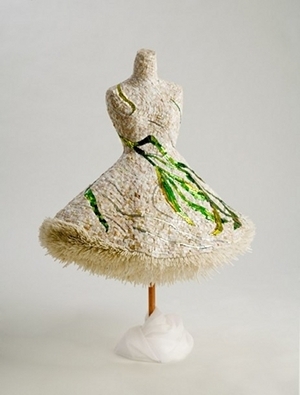 Richey’s figurative dress sculpture in marble, glass smalti and seashells is entitled La Corrente (The Current). Richey has worked in the mosaic medium for more than 20 years, creating custom residential and commercial mosaics. 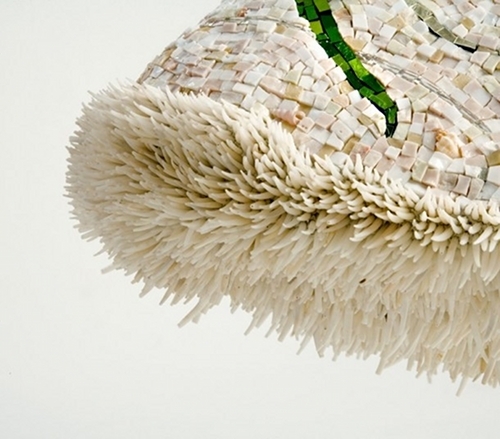 She has earned international recognition for several recent projects, including the 2009 Orsoni Prize for Night Shirt, a wall relief mosaic depicting San Francisco Bay at midnight. 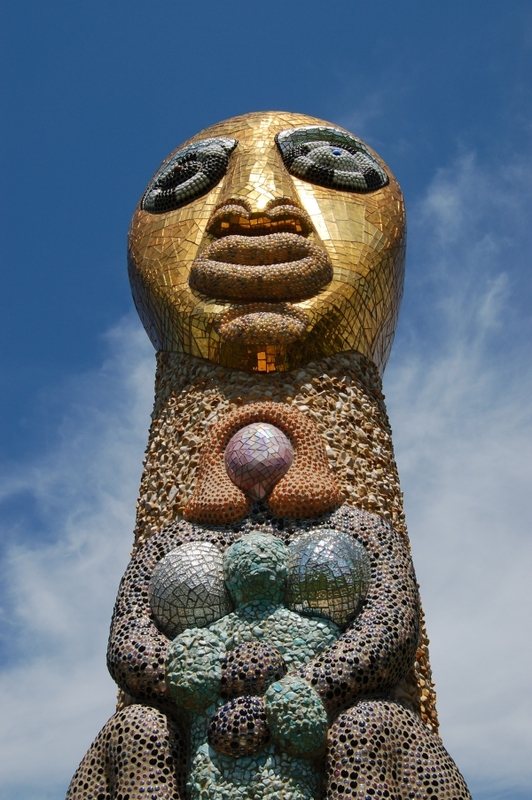 In October 2011 Richey will be leading a Mosaic Masterpiece Tour to Rome and the Vatican Micromosaic Workshop, Niki de Saint Phalle’s Tarot Garden in Tuscany and the International Mosaic Festival in Ravenna. Richey’s work can be viewed at www.juliericheymosaics.com. Image 2  Back view. Image 3  Dentalia, or sea spines, coat the entire underside of the dress.